January, 2014. I have been retired from agility competition for several years now since I tore the ACL in my knee I am hoping to have my knee repaired this year and get back in to competition in 2015. September 2008. Our Bébé is now in the Masters level of AKC agility! Our Katey qualified for the top-five AKC agility-dog list for each breed and is eligible to compete in California this year in the televised agility invitational trial. Run Katey run! Click on the small photos below for video links. In October 2003, I entered a fun match at the same training center. Bogey did very well, but again Bébé excelled. She took home what would have been a first place win if it were a real trial. That was very exciting. Bébé and I started attending group training sessions at Bon-Clyde in Sanford, North Carolina. I did not enroll Bogey in classes as much of what I learned was handling technique. 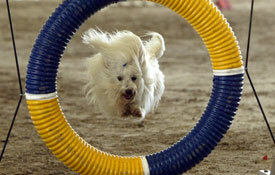 But, Bo and I practiced what I learned in classes about once a week at the agility field near our home. 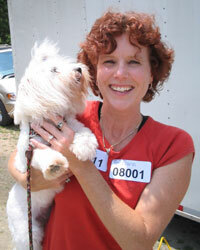 The first trial where both dogs competed against each other was March 13-14, 2003 in Providence, NC. We did excellent, Bébé won three first-place ribbons with scores of 100, 100, and 90. Bogey won two second-place ribbons (to Bébé's first!) with scores of 99 and 97. 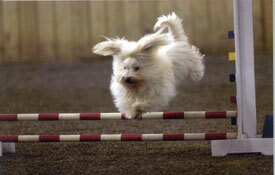 I was elated, and hooked on competing in agility. The dogs ended up having a very successful season; see the statistics above. Even though Bébé shows the most potential, mostly because of her enthusiasm for the sport, Bo has done exceptionally well. He has never attended a group training session but has still managed be in the top-level in one of the two types of agility courses. When I first decided to breed Cotons, I knew it would be necessary to earn titles for my dogs. After talking to exhibitors about conformation, obedience, and agility trials, I decided that showing in agility would be best suited for us. Agility shows are exciting, and fun to compete in, and the dogs and I share a comradery that I don't think we'd have in any other type of venue. My agility titles prove the dogs are smart enough to learn the complex techniques and commands needed to compete in agility. They are healthy, strong, obedient, and have fabulous temperaments as proven by their ability to constantly work around other dogs and people. My agility goal for the future is to take both of the older dogs to the top level, Master Agility Champion, (MACH). Unfortunately, I have to take a year off from most agility trials in 2005, but I can't wait until the 2006 season! 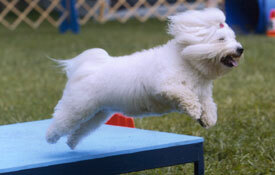 I've already begun training our puppy, Katey, for agility and she adores it. Katey's sire is Happy Go Lucky, and he is ranked 5th in the nation in UKC agility. 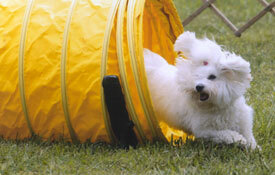 If you are interested in training your dog or puppy for agility, I would be more than happy to share what I've learned. 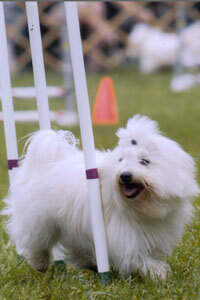 A good place to start is on the AKC's web site. Here's a link: AKC Events. Good luck and happy jumping.